Folio 897 of the Codex Atlanticus contains two variants of the same design. 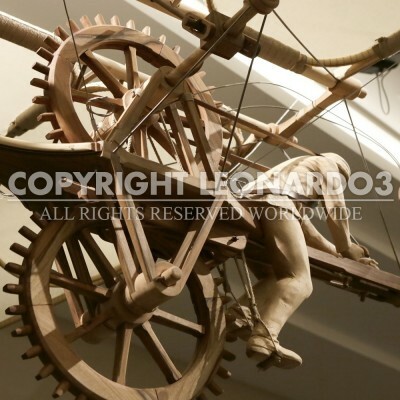 Above is a machine governed by just one pilot, the pose of these pilots recalls that of the modern cyclist (though we must bear in mind that bicycles did not yet exist in Leonardo’s time). This was a youthful design; the search for a flapping-wing solution reveals some lack of knowledge. 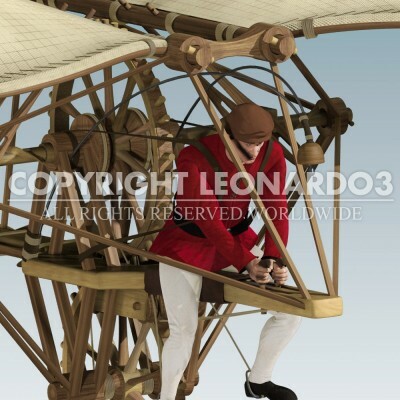 As the years passed, Leonardo would develop designs for gliding flight that were far more effective. Nevertheless, this design hides a detail that is technically extraordinary. In front of the pilot’s face Leonardo drew a small, upside-down ampulla from which a small object is suspended. This is a bona fide attitude indicator (and probably the first in history)! The knocker would indicate to the pilot the machine’s inclination and the attitude of flight. When the machine was in rectilinear, horizontal flight, the pendant would not touch the edges of the bell.